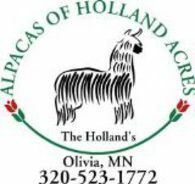 Openherd: Alpacas of Holland Acres is a farm located in Olivia, Minnesota owned by Katy and Delaney Holland. Welcome to Alpacas of Holland Acres… Where Fiber Grows With the Tulips! Holland Acres is an ever growing farm with high expectations, not only for the alpacas, but for ourselves. Located on a couple acres in the middle of lake and farm country, it is the perfect place to raise suri alpacas. Away from the hustle and bustle of the big cities, everything is calm. The alpaca's beauty and elegance fit in perfectly with the landscape. We strive to produce healthy and happy animals. We select the best genetics from across the country to better our herd. Our knowledge is important to the health of our herd, so we are always willing to learn more about alpacas. We are human, so mistakes are made. But what sets us different from other alpaca farms is that we strive to fix those "mistakes". At Holland Acres, quality always comes before quantity. We guarantee it! Our suris exhibit some of the best fiber found anywhere in the world. It flows in beautiful locks of luster. Our suris are known for their extremely dense fiber. Many of our alpacas have won ribbons in shows and have proven their greatness in the production of offspring. After 11 wonderful years in the alpaca industry, we have decided to offer our Suri herd for sale. We have 10 ARI registered SURI alpacas. Our Herd consists of 3 males and 7 females. All of our animals are calm. We are asking $8000. Our financing options are flexible. Message me, email or call. Lets talk alpaca.